The Ricoh Aficio MPC2000 is a multifunction business-orientated printing station that is available in a number of configurations. 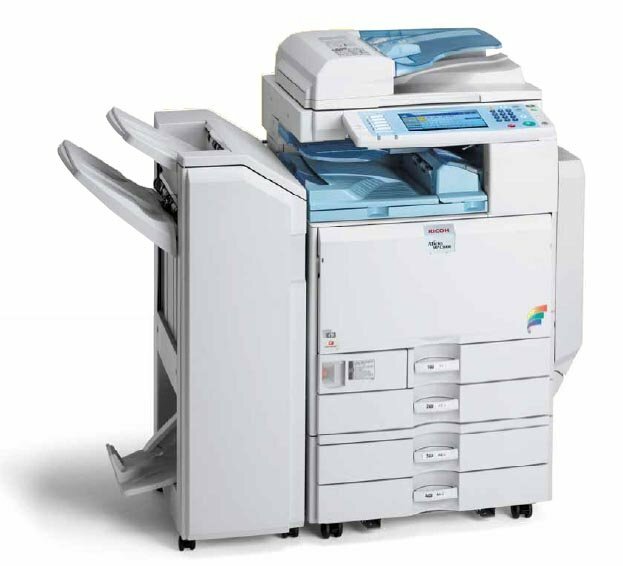 The most common configuration is the MPC2000, which is a mono and colour printer, copier and scanner. The second most common configuration is the MPC2000 SPF. SPF indicates that the fax and PC-fax functionality are included standard. Owners of the basic MPC200 can purchase the SPF component as an add-on. For printing, copying, and scanning, the MPC2000 in any configuration has a maximum optical resolution of 600 x 600 dpi, and it produces both colour and mono prints at a rate of 20 pages per minute. The MPC2000 is a fully network-ready printer server, but not all configurations support network scanning and other network features. Most business-oriented printing stations such as this one tend to be cumbersome and have stodgy aesthetics. Ricoh, on the other hand, does an excellent job fitting function and visual design cues into a relatively small amount of space. This is an extremely streamlined and attractive office printer. Seated on its base, it will need a dedicated area, but Ricoh also provides four high-quality caster rollers, which make moving the printer around the office relatively easy. The Ricoh Aficio MPC2000 also boasts an oversized full-colour LCD touch panel display that is impressively sophisticated and intuitive. Every feature and configuration option available is conveniently accessible. The Ricoh MPC2000 toner printer is a tremendous, highly functional printing machine that costs less than most competitive models that offer the same function and performance. Ricoh also does an excellent job with the "little" features. You can tell that a great deal of thought went into the design, and it feels like they actually consulted the people who use these machines. Placement of almost every feature is spot on. Cartridge Save also offers affordable, high-yield Ricoh MPC2000 toner cartridges, especially in black. There is not a lot to like about the Ricoh Aficio MPC2000. One negative is that they componentised the printer more than most manufacturers do. They did this so they could offer an aggressive price on the base model. Of course, this means that the base model is missing features common to other base models: fax, PC-fax, Internet fax, network scanning, wireless LAN and so forth. The upside is that you can add these when needed, but in the end, it'll cost you a lot more than simply buying the deluxe model at the start of the process.